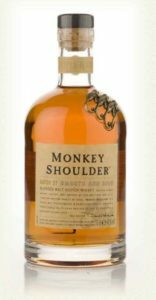 Monkey Shoulder scotch is a blended scotch of three, different, Speyside Single Malts: Glenfiddich, Balvenie, and Kininivie. 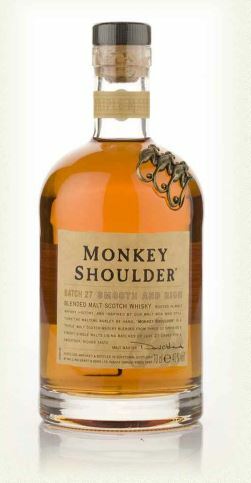 The story on the back of the bottle provides an interesting story as to how Monkey Shoulder Scotch got its unusual name which is derived from the malt men who doing the shoulder-wrenching job of constantly turning the malted barley by hand to make small batches of delicious whiskey. I will boldly say that this scotch is deserving of this name for a much more important reason: That is, you will throw your shoulder out from the thousands of times you will be lifting the glass up to your lips to consume this delicious, liquid gold. Monkey Shoulder scotch is one of the best blended scotches I’ve ever had. It is actually similar to a Speyside Single Malt like Glenlivet, but it is even better than that. Getting bargain shoppers to agree on the best affordable scotch might not be an easy task. There are certainly some inexpensive scotch whiskey out there, but how do we define which one is best? Does the best affordable scotch have to be single malt or can it be blended? Does it necessarily have to be smooth, or would you prefer to sacrifice some smoothness for special flavor and character? And how cheap does the best affordable scotch have to be to be considered at the top of the list? Of the few bargain-priced, scotch whiskeys I’ve tried I have never really found a very good blended malt that is smooth and flavorful. On the other hand, I’ve tried some affordable single malt scotch that is very smooth, but does have a whole lot of substance and taste. Lismore is a good, affordable single-malt scotch that comes to mind. Unless a single malt scotch is unusually smooth, I decided I’d rather pay a little more for something with some interesting scotch-like flavors. Since the more affordable scotch’s are not aged very long, they are hard to find. Time to check my favorite region for Scotch and see what is available. For character, flavor and excitement, Islay single malts are the best in my opinion. Unfortunately, they are also usually among the most expensive. I’ll never forget sitting in a restaurant with my wife on our 10th anniversary sampling scotches and choosing one with the weird name, Lagavulin. I thought it was amazing. Very scotchy and peaty. I also enjoyed what I thought was saltiness. When I went home I confirmed that what I was tasting was indeed salt and it’s from the barrels which are aged near the Atlantic ocean. With Islay single malts, you are literally sipping a bit of salt from the ocean. How neat is that? I later bought a bottle of the very expensive Lagavulin which costs about $90 today. I really learned to love it, but if only it was a little more affordable. Don’t think for a minute that MacGavins is anything close to being as good as Laphroaig or Lagavulin, but for the price it is quite good and even satisfies a little bit of the craving for the salty characteristics of an Islay single malt. MacGavins is not aged – or at least it doesn’t say how long on the bottle. The 1.75 Liter pictured above cost about $35.00. Even if it is not a premium Islay Single Malt, MacGavins is one of the best affordable single malt scotch whiskeys you can buy. The MacGavins is very dry in the nose and really pretty smooth for a whiskey that doesn’t claim to be aged. I tasted some brown sugar, caramel and even a little pear. Also, there is definitely some noticeable saltiness – and that it is a good thing. The whiskey isn’t as dark, intense or peaty as either Laphroaig or Lagavulin, but it is certainly tastier than some of the cheap single malt scotch whiskeys I’ve had from other regions. MacGavins is a keeper for an every day, good drinking, Islay single malt scotch. Either Lismore or McGavins are the best affordable single malt scotch that I’ve tried. Take your pick. Inver House Green Plaid Scotch is one of the best liquor bargains I’ve run across this year. I’d put this scotch right up there with Ruskova Vodka and Rancho Alegre Tequila among bargain liquor brands I’ve discovered that taste significantly better than discount liquors. Inver House Green Plaid Scotch is priced similar to other well known discount brands such as Highlands Mist, Scoresby, Clan Macgregor and other blended scotches that sell for $17.00 or less in the big, 1.75 liter bottles. What prompted me to give Inver House Scotch a try? Well, the Inver House scotch bottle marked with the green plaid label was sitting right next to the Highland’s Mist 1.75 Liter for only .50 more. Inver House scotch was an unfamiliar name to me at a very cheap price, and I’m always looking for new, affordable liquors to try. Secondly, you cannot really get anything that tastes worse than Highlands Mist for your everyday drinking Scotch. I’ve never really met a Scotch I couldn’t drink, especially when served in mixed drinks like Rob Roys. For 50 extra cents, the Inver House Scotch presented itself as one of those opportunities to review yet another discount brand of liquor. I paid $14.49 for the Inver House and took it home, eager to try it for my weekend’s cocktails. Inver House is a blended scotch. Normally, when I buy a bottle of Highland’s Mist I use it to make a large pitcher of Rob Roys which I keep cold in the refrigerator. In case you’re not familiar with them, Rob Roys are a scotch drinker’s martini and listed among my Top-10 mixed drinks review. A Rob Roy is simply 3 parts scotch mixed with 1 part sweet and dry vermouth and a couple of dashes of bitters; shaken with ice and served straight up in a martini glass with a cherry. While a good Scotch will certainly make a better Rob Roy, a really good one cannot be improved by turning it into any kind of mixed drink. Inver House Scotch is almost too good to use in any mixed drink. But at $14.50, I think it can certainly be justified and the result will be a much better tasting Rob Roy. Is Inver House a Good Sipping Scotch? Though Highland’s Mist is not a very good sipping scotch, almost any blended scotch tastes pretty good to me after I’ve had enough sips of it. I decided to pour a shot of Inver House directly into my glass without ice and see how it compared. There really is no comparison. Straight and without ice, the Inver House green plaid scotch is good enough to drink by itself and enjoy right from the very first sip. Now, I won’t lie to you and say that Inver House compares to an expensive blended Scotch like Chivas or Johnny Walker Black, but it does taste significantly better than any blended scotch I’ve bought for under $20.00. So, what is it about Inver House that is better than other cheap, house brands of Scotch? Inver House Scotch is not only smoother from the very first sip, but has a scotchier flavor than most house brands. The Inver House even has some of the flavorful characteristics of some of the more expensive brands of blended and single malt scotches. I noted hints of caramel, banana, bubble gum and a very slight bit of peat and smoke. Its light, scotchy flavor sort of reminds me of Cutty Sark. You can definitely sip on Inver House scotch by itself, with or without ice. I’d take Inver House scotch over medium priced brands like Passport and it might even give Cutty Sark a run for its money. It’s been a while since I tasted Cutty Sark, so I won’t rely on my memory to give it a fair comparison. Suffice it to say, however, Inver House Scotch is my new favorite house brand. If there is one disadvantage to Inver House it is that it is very hard to find. I was a good 12 miles away from home, when I found the Inver House on the bottom shelf of a liquor store I rarely visit. I am pleased enough with this scotch to make a special trip and stock up with 2 or 3 bottles of Inver House Green Plaid Scotch. Who Can Afford Single Malt Scotch? Have you acquired a taste for single malt scotch, but don’t feel like plunking down $40 or $50 bucks a bottle every time you visit the liquor store for the best scotch? (The very best brands of single malt scotch can cost 5 or 6 times more than that!) Take heart, you CAN afford to drink single malt scotch. If you’re like me, you save your single malt scotch purchases for special occasions once or twice a year. I have always looked forward to buying good scotch whisky for the Holidays or sometimes will ask for my favorite brand of single malt for a birthday present. For most of us, drinking a good single malt scotch everyday would leave little room for groceries; that is, until you’ve discovered Lismore. Lismore single malt is a Speyside scotch that can be had for around $15 – $17 a bottle. It is a rather light tasting single malt scotch with very subtle flavors of vanilla, honey, buttery almond, toffee and some cherry. Due to its rather light, subtle flavors, Lismore single malt scotch is not likely to be the favorite of scotch connoisseurs with deep pockets, wanting something more distinguished like the deep, smoky flavors of Lagavilin or Laphroaig. On the other hand, it’s light, smooth, rather ordinary scotch flavor is what makes this such an attractive scotch for your everyday or beginning scotch drinkers. As a single malt scotch, it is also tasty enough, that a true scotch whisky snob won’t object to it either. Lismore is not a difficult liquor for even experienced scotch drinkers to enjoy. It is smooth enough that it doesn’t have that initial bite of alcohol you might notice from a cheaper malt whisky. Lismore single malt scotch makes a great every day drinking whisky, and it won’t set you back an arm-and-a-leg to enjoy regularly.